The Titan play system is one of the ultimate play systems in the Explore universe. The play system is divided into zones, so that several play activities can take place simultaneously, and so that several age groups can play at the same time without disturbing each other. Titan has play elements that address all aspects of child development – cognitive, social, emotional, motor and, not least, physical. 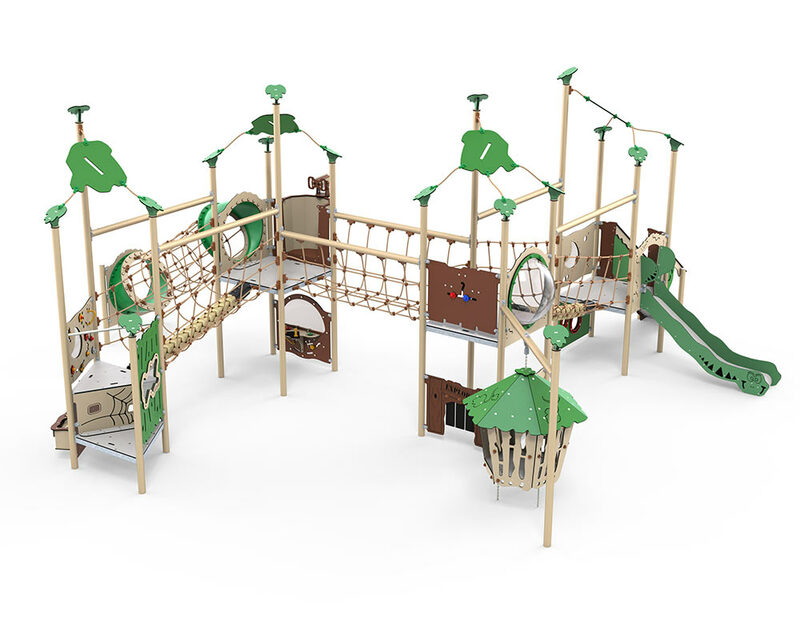 The Titan play system incorporates, for example, different suspension bridges, a helicopter panel with a dome window, a rope tunnel, a slide, countless play panels and, in particular, a designated play area for toddlers. Please read more below. Titan has a special play area for the smallest children. Here, they are able to immerse themselves in play activities which train their fine motor skills. On the outside are the sand panel and kitchen panel, and under the platform is a space that functions as a den. The low step height ensures that even the smallest children are able to climb up onto the platform. The large window on the right-hand side encourages children to consider the world from a slight distance and engage in social play, while the activity panel on the uppermost step provides a range of fun activities with moving parts. Playing on the sensory panel strengthens children’s fine motor skills, and all the different handles and moving shapes stimulate their sense of touch. The panel window also makes it possible to interact with children in the kitchen below. A space has been created here with activities that promise hours of fun for younger children.